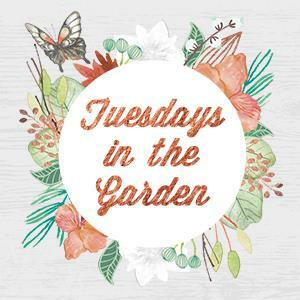 It’s our Tuesday in the Garden Blog hop! This week our Theme is garden tours! Enjoy a peek into all of our 2016 gardens and projects! Please remember to visit the other blogs by scrolling to the end of this post and clicking the blog links. Happy Gardening! It’s high summer and the garden produce is starting to roll in the door from our garden and greenhouse. This is my VERY favorite time of year. The days are long and warm. The garden is maturing and we have Tons of fresh, delicious produce to enjoy. This is the quiet moment of summer, before the fall harvest time when we run around in endless circles from garden to kitchen sink, to stove, to freezer. When the garden is just maturing in spring we harvest by the handfuls, rather than bucket fulls. Every day is like a treasure hunt. We love going out on daily garden walks to see what we can find. This week we are moving into the mid-summer gardening stage. New veggies are ripening everyday. We are eating very well right now. Lots of great salads, stir fries and slaws! Our green juicing frequency is also revving back up. We have an abundance of produce to use up. Drinking up greens is an excellent way to keep ahead of the garden and improve health! Strawberry and pea season is over for the year. Dave has the strawberries trimmed and he pulled out the pea plants yesterday. Our strawberries were too dry this year for a large harvest. They were small and sparse and not as sweet as they should have been. 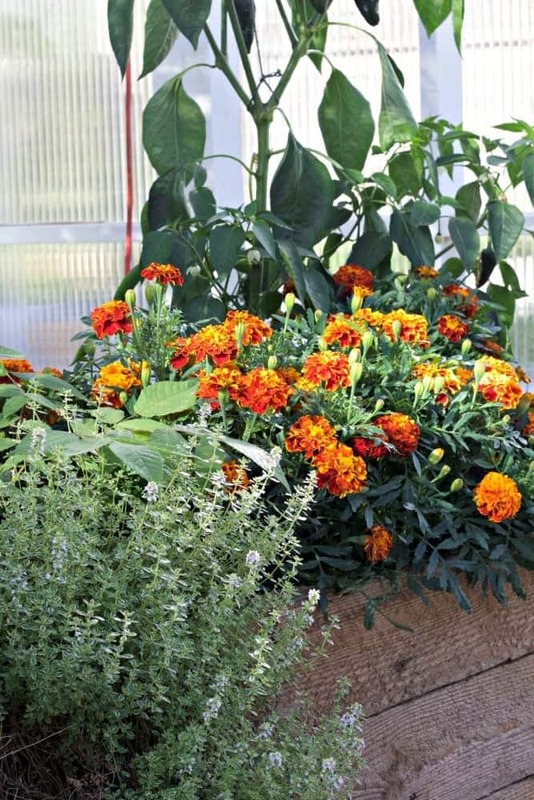 We DO love the lasagna method of gardening! Look at how weed free our garden is. Wherever we DIDN’T mulch the weeds are growing like crazy (Notice the compost area). 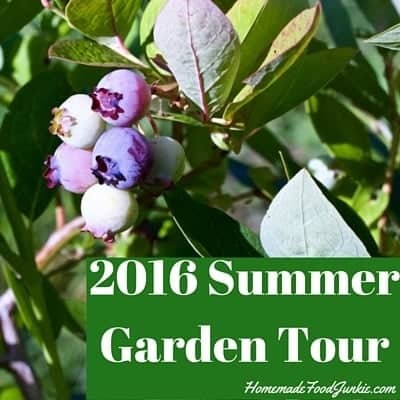 2016 Summer Garden tour. The garden is doing ok so far but we do have some challenges this year! 2016 Summer Garden tour. No problems in this bed! Last year Dave made an ENORMOUS raised bed for our new raspberry patch. This year that bed is bursting with HUGE raspberry bushes. There are a few first year berries. My biggest crop from there this year will be raspberry leaves. I may dry them for tea! He also planted nine new blueberry bushes. All of our blueberry bushes are young so they don’t produce a lot yet. But both the raspberries and blueberries are gifting us with fresh berries for dessert. We love them! I can’t wait to get enough to freeze! 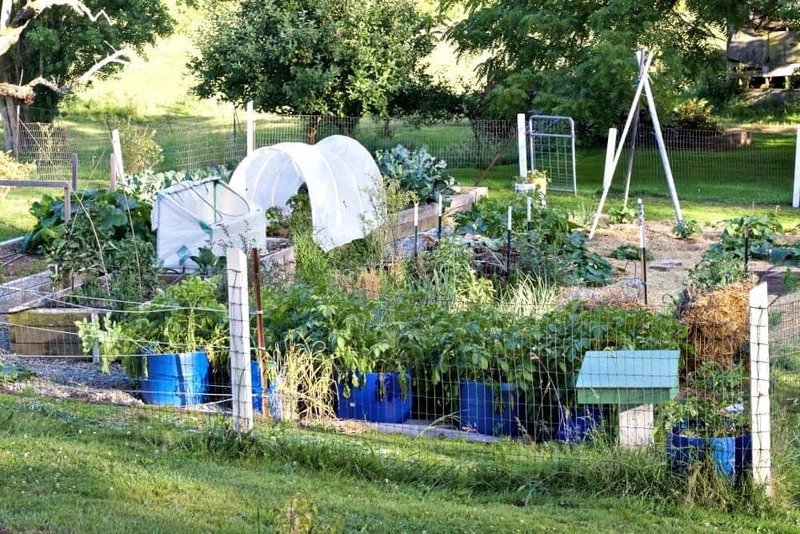 2016 Summer Garden Tour – Garden Pests, Perplexing Corn and a drying well! Until about two weeks ago all the produce in our garden was growing along and looking great! We are still perplexed about the corn…Dave has replanted it THREE times! And it’s still very spotty and lackluster. We have pretty well given up on it for this year. Knee high by the Fourth of July? Today is the Fourth of July. It’s more like ankle high. Bad year for our corn! The Potatoes are looking a bit sad, part of the reason is they are maturing so the tops die off. But they are also getting full of little holes and now we know why. Flea Beetles! They love our potatoes! Even more sad; they are slowly moving across the garden. We can track their progress by looking at the plants as the beetles find new ones. They haven’t gotten to ALL of our garden plants yet. But they will by seasons end. Dave is attacking the those nasty beetles with Diatomaceous Earth. That is somewhat helpful. It seems to slow them down anyway. Organic gardening means we share with the pests to some degree. Weeding today, we found another unwelcome garden pest. Aphids! In our rhubarb and squash! 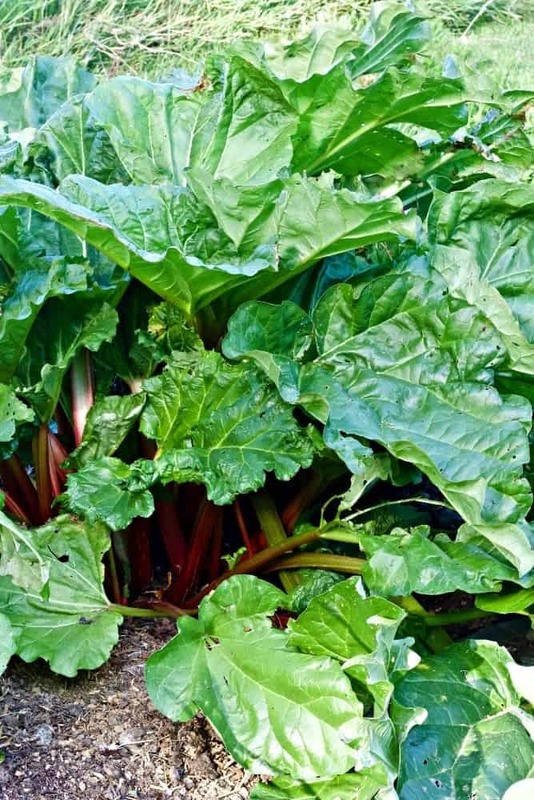 Surprising that aphids like toxic rhubarb leaves. But they do! In fact from the astonishing number of black nasties I found; they LOVE rhubarb leaves. Dave sprayed the aphids with Neem’s Oil to hold them back a bit. I harvested many stalks of rhubarb infested with aphids and put them in the freezer. The stalks were unaffected by the aphids, fortunately. I also made a blueberry rhubarb pie. So nice to have our garden providing for the table again! Other than an unending number of slugs; flea beetles and aphids are, so far, the biggest pest problems we have found. Cabbage worms were, hopefully, caught early when our cabbages were young. We hand-picked them off the small, still open leaves. We just ate our first cabbage and it’s lovely. No damage at all. Gorgeous Red Cabbage. The flea beetles haven’t found this raised bed yet. Note the black line on the bed. That is part of the automatic watering system. We highly recommend this water and time-saving system! 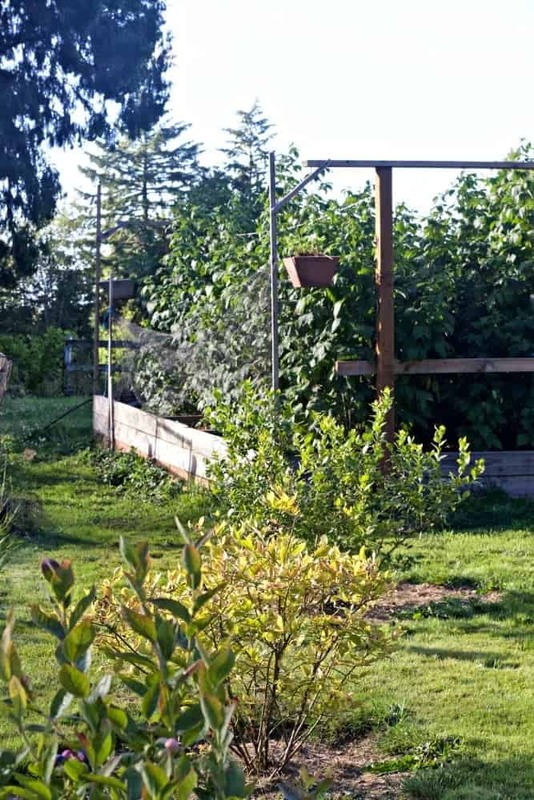 Our biggest garden challenge is our old well. It’s drying up! We still have water….but I’m not sure how much longer. We are beginning a remodel project on our house next month. Drilling a new well is off the table this year… Unless it goes completely dry. We are severely rationing the outdoor watering already and summer is barely here! Thank goodness Dave installed our automatic watering system. That is such a help in keeping the water on the plants without so much water wasted. Kohlrabi. 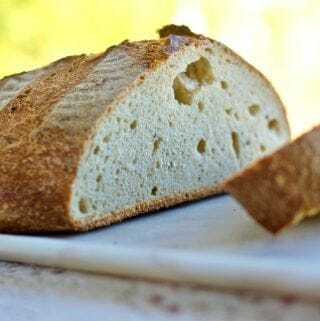 Sort of the texture of Jicama with a mild crisp flavor. We love it! Our green beans and squash are off to a good start. Notice the straw bale potato towers in the rear left corner. Notice the two straw potato towers in the rear of the garden? Dave harvested one tonight. Look what he brought in for dinner tonight! Purple potatoes grown in our straw bale tower. We have never grown purple potatoes before. I had seen them and was curious about them. I looked them up and found out these pretty purple spuds contain the highest level of nutrients of all potatoes! So of course we had to try them. They taste great too! Mild and buttery. Green beans are just starting to grow up the poles! Dave’s favorite garden space is his greenhouse. He is in there all the time! Dave reduced his number of peppers and tomatoes this year. There is an open look and feel to the greenhouse beds. The Tiburon peppers and tomatoes are ripening. Tiburons are usually much later to harvest. It’s delightful to have them so early in the summer! Dave grows marigolds as companion plants. He loves Lobelia so it’s also gracing our greenhouse beds this year along with volunteer nasturtiums in the tomatoes. Roma Tomatoes. Notice the burned leaves. Dave is using an organic spray on the to kill off wilt. It does stop the wilt but ruins the leaves. The tomatoes are perfect! Dave’s latest project. Flowers! He’s growing lobelia and around our house he has containers of begonias. They are small yet. I’ll photograph the begonias when they get big and blooming. The nasturtiums are volunteers. They love the greenhouse! Corinto Cucumbers growing up Dave’s trellis. So far the plants looks perfect! Finally, I’ll share a photo from our herb garden. A few years ago I started planting herbs in the raised flower garden around our pond patio. It’s maturing now into a lovely summer display. It handy to have the herbs close by the front door. I can easily run out with my shears and clip off some sprigs for our meals. This year I will get plenty to freeze! Lavender, mint and oregano. Thyme and sage are out there. So far I can’t keep parsley or basil outside or in the greenhouse. Aphids and slugs love them! 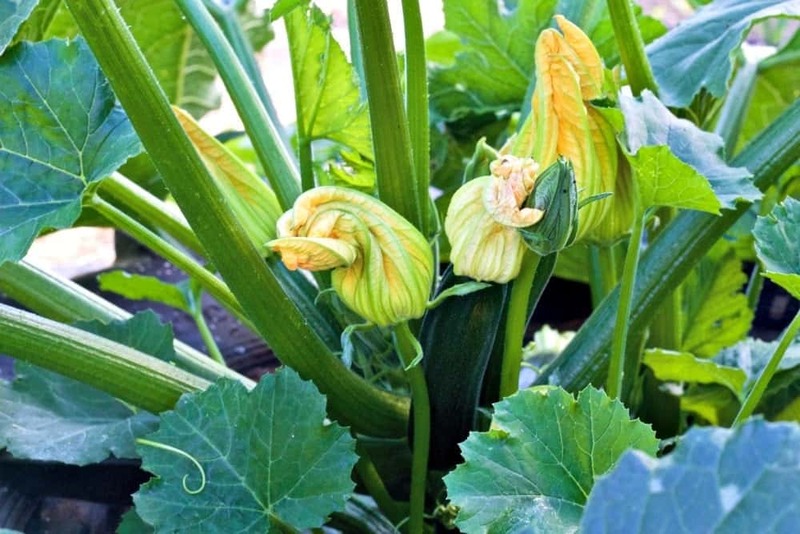 Please stop by our other blog friends to see what they are growing this season. Gardening is so fun and SO endless! you will find many great gardeners in this blog hop! 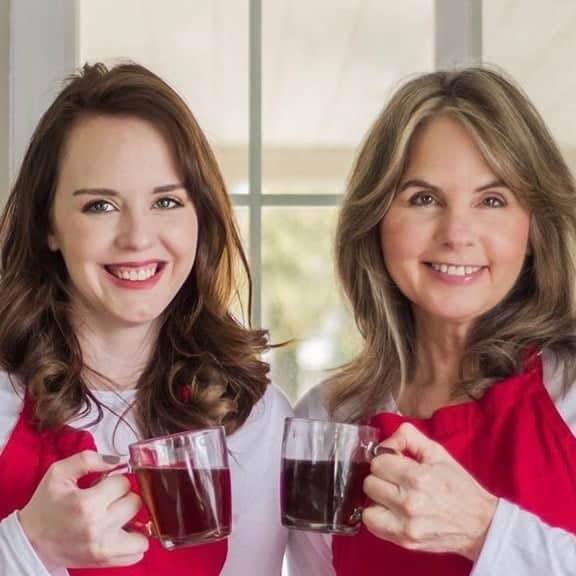 Both flower and vegetable gardeners! Wow, I wouldn’t have thought that aphids would like rhubarb leaves. We had aphids on our broccoli earlier this year but they haven’t shown up on the rhubarb which is good. We need to retreat the roses again as I noticed a few aphids on them this week. Our cucumbers and tomatoes are just starting, I didn’t cover them this year like I did last year so I think that’s why they are a little slower than usual. I love your garden. You must have quite a big greenhouse to grow so much inside. Thank you Shelly, our greenhouse is sizable. We treat it like a retreat. Dave spends a lot of time out there talking to his babies and fussing over them. Aphids are the pits. But I am really beginning to hate those darn flea beetles! Bummer about your issues, Diane. 🙁 I’ve had problems with corn, too, in the past – I found covering it with a row cover right after planting and planting thickly and then thinning helps. I think the birds like it! ahh! That might be our answer Jami. Thanks so much for sharing your experience. That might be what we will do next year. It never occurred to us that birds might be eating the seed!